Joshua Brewster Bolten (born August 16, 1954) is an American lawyer and politician. Bolten served as the White House Chief of Staff to U.S. President George W. Bush, replacing Andrew Card on April 14, 2006. Bolten was born to a Jewish family, the son of Analouise (née Clissold) and Seymour Bolten. His father worked for the CIA and his mother taught world history at George Washington University. He graduated from St. Albans School, and served on the school's board until 2007. Bolten attended Princeton University, where he studied in the Woodrow Wilson School of Public and International Affairs and served as class president and president of The Ivy Club. He graduated in 1976. He graduated with a J.D. from Stanford Law School in 1980 and served as an editor of the law review. Bolten is sworn in as White House Chief of Staff by his Deputy Joe Hagin; his predecessor Andrew Card looks on. Formerly the Director of Office of Management and Budget (OMB), Bolten was confirmed by the U.S. Senate to that position in 2003. 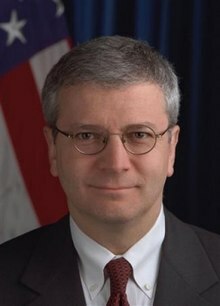 Bolten was Deputy Chief of Staff for Policy at the White House from 2001 to 2003. He previously served as policy director for the 2000 George W. Bush presidential campaign from 1999 to 2000 and as Executive Director for Legal and Government Affairs at Goldman Sachs in London from 1994 to 1999. 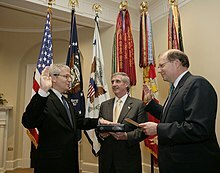 He was general counsel to the Office of the United States Trade Representative for three years and Deputy Assistant to the President for Legislative Affairs for one year during the administration of George H. W. Bush. Bolten was the second Jew appointed as White House Chief of Staff (Ken Duberstein, who held that post during the Reagan Administration, was the first, and Rahm Emanuel, who held the post in the Obama administration, was the third). Bolten was named as White House Chief of Staff to smooth relations with the United States Congress, and to reinvigorate the West Wing staff. He is credited with having assisted the President in recruiting Henry Paulson—then-CEO of Goldman Sachs—to serve as Treasury Secretary, based on his former employment at the firm. In addition, he recruited Tony Snow to work as White House Press Secretary, offered Rob Portman the opportunity to succeed him as OMB Director, and brought his OMB deputy Joel Kaplan into the White House as Deputy Chief of Staff for Policy. Bolten became the John L. Weinberg/Goldman Sachs & Co. Visiting Professor at Princeton University's Woodrow Wilson School in September 2009, teaching classes on the federal budget and international trade and financial regulation. In March 2010, Bolten was appointed a member of the board and co-chair of the Clinton Bush Haiti Fund, which has raised $36 million to date for immediate earthquake relief and long-term recovery efforts in the Caribbean country. Bolten plays bass guitar in a band called the Compassionates. In 2015, Bolten married Ann Kelly. ^ Tablet Magazine: "Talking to W’s Chief of Staff - At the GOP convention, Josh Bolten reminisces about introducing President Bush to shmurah matzo" By Yair Rosenberg August 30, 2012. ^ "Analouise Clissold Bolten's Memoriam on The Washington Post". The Washington Post. ^ Birnbaum, Jeff (Summer 2004). "Josh Bolten '80, nicknamed "Yosh" by President Bush, is one of the most powerful people in Washington. And he's a darned good bowler to boot". Stanford Lawyer. Archived from the original on October 13, 2006. ^ Cai, Angela (March 29, 2006). "Bush names Bolten '76 chief of staff". Daily Princetonian Publishing Company, Inc. Archived from the original on December 6, 2008. Retrieved July 6, 2008. ^ "Joshua Bolten, White House Chief of Staff". Archived from the original on March 3, 2014. ^ "Bush Praises Bolten's Humor and Candor". CBS News. March 28, 2006. Archived from the original on December 5, 2008. ^ Copeland, Libby. "Sideman". The Washington Post. Retrieved April 3, 2010. ^ Berger, Matthew (March 31, 2006). "New chief of staff has strong Jewish identity". Jewish News Weekly of Northern California. Archived from the original on September 19, 2012. Retrieved March 14, 2007. ^ Gleckman, Howard (May 30, 2006). "Paulson to the Rescue?". BusinessWeek. Archived from the original on February 25, 2012. ^ Baker, Peter (June 17, 2006). "White House Personnel Changes Complete". The Washington Post. ^ Princeton University (2009). Former Bush chief of staff Bolten to join Wilson School faculty. Retrieved July 8, 2009. ^ "Bolten '76, Frist '74 appointed to serve on Clinton Bush Haiti Fund's Board of Directors" by Daily Princetonian Staff, March 22, 2010. Retrieved 2010-03-30. ^ "White House's Bolten shows "Born to be Wild" side". The Scotsman. Edinburgh. Reuters. June 16, 2006. Archived from the original on December 11, 2006. Retrieved December 25, 2006. ^ Bennett, Kate (April 30, 2015). "Surprise! Josh Bolten's married". politico.com. Friends discuss Bolten's college experience at dailyprincetonian.com. This page was last edited on 9 March 2019, at 15:01 (UTC).